George took Jo Anne to Rome first in 2011 for New Years Eve. He knew she liked architecture and interesting cities. She had never been to Italy so this was the perfect place to visit first. 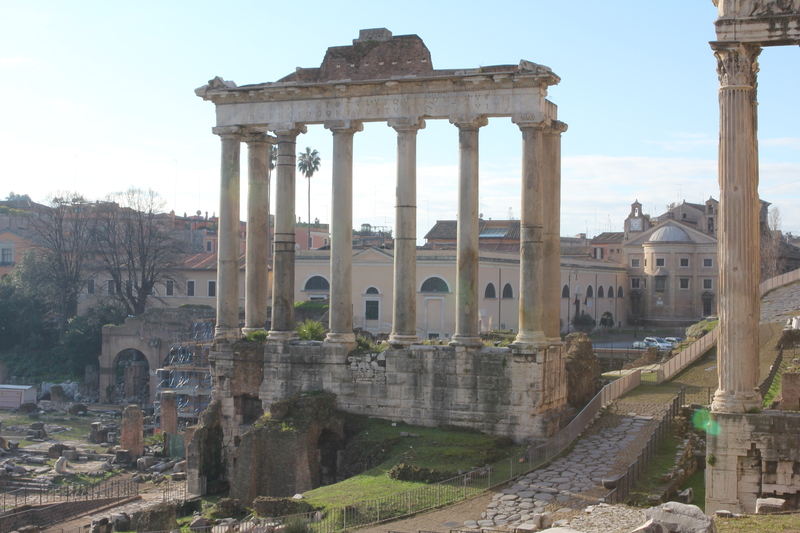 Jo Anne was totally amazed by Rome as you will be if you haven’t yet seen it. It has everything about Italy that we talk about in this BLOG. The food, wine, people, sights and architecture. New Years Day we went to the coliseum, it was closed but walked empty streets and had rome to our selves. 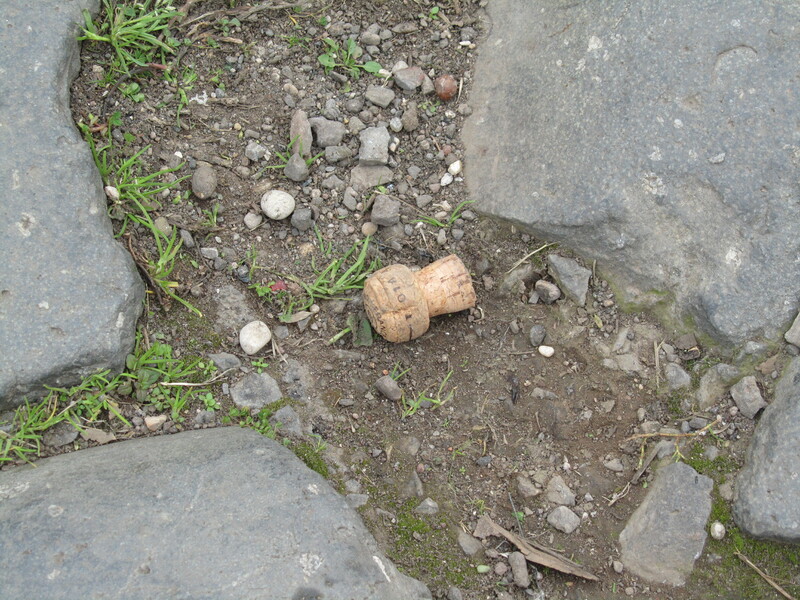 We saw the remnants of New Years Eve (champagne corks) in the streets. Rome is the eternal city. There is no other like it. To walk its streets and think of Roman soldiers walking the same streets millennia ago wow! We loved Rome. Its people, wine, food and buildings. Here is a simple tour of Rome and how to get around on your own. Rome is a walking city. If you can’t walk much take the metro or a taxi. Pantheon, Campo de Fiori and Piazza Navona – Standing facing the Trevi Fountain take the pedestrian walkway to your left. 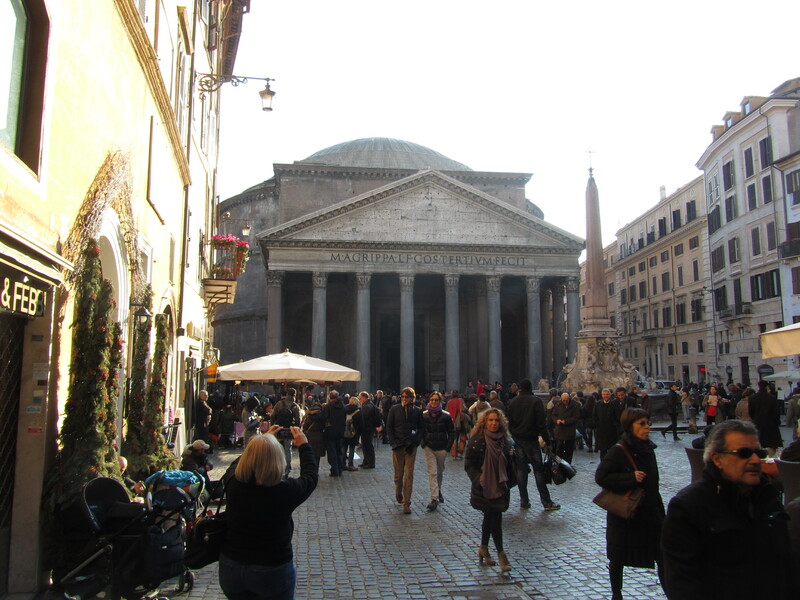 It winds through some small piazza and past some nice restaurants to the Pantheon. 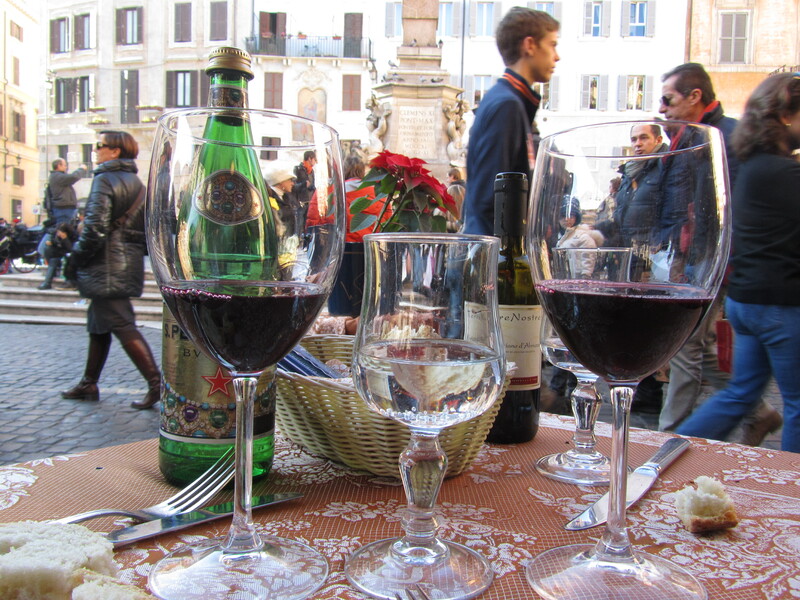 Piazza Campo de fiori is a short walk away. It has Rome’s flowers and fresh fruits and vegetables. Piazza Navona is a direct walk from here. It is a very large piazza with fountains and restaurants. Central Train Station – You can catch a train to nearby towns like Naples, Pompeii or Orvietto. There is also a train that runs to Fiumicino Airport. Have a pizza, eat the food, enjoy the local wine, stop in a bar for breakfast and have a cornetto and don’t forget the gelato. We also walked neighborhoods like the left bank, right bank, Champs-Elysées, and Montmartre. We stayed near my favorite street in Paris, Montorgueil. This pedestrian walk way has many small cafes, fish stores, fruit stands, fresh vegetable stands, etc. There is even a Starbucks but we prefer a French espresso in the mooring with a flakey croissant. Only the French and only in Paris is the croissant done correctly. George often tells people, if after eating one there is not a mess of crumbs on you, it is not a good croissant. We also be made two side trips outside of Paris (in addition to Versailles which is in a suburb of Paris). Reims (Champagne Region) – No trip to France should be done without a trip to Champagne for a tasting of real French Champagne. We toured the Tattinger cellars in Reims. Reims is a beautiful city with its own Notre Dame (Our Lady). Many French cities have one commemorating the Blessed Mary. We took a high-speed train (200 MPH) from Paris (Gare Est – East Train Station) to Reims. It was a 45 minute trip on the high-speed train (one and a half hours on the normal train). Gilverny – Monet’s house. Gilverny is another beautiful small french city. 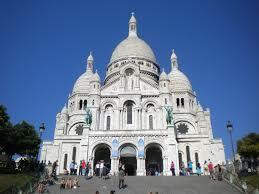 It can be reached by train from Paris (Gare St-Lazare – St. Lazare train station). 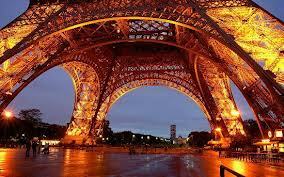 Paris in the Spring will be beautiful and memorable. Every bucket list should include a romantic stop in Paris! Rome is a magical city of old and new. It is modern new and Roman old. You can not walk the streets of Rome without seeing both worlds. As they dig to build a new building, they hit old Roman ruins. They are protected by Italian law. They may build the lobby of the building around the ruins. How cool is that? Rome is a city of architecture, narrow streets, shops, restaurants, bars and a lot of very modern people. Rome has great public transportation. It has busses and subways (Metro) that you can take anywhere. It is a safe and easy to use system. We had wonderful weather in the end of December beginning of January. It was cool but not too cold so we walked everywhere. Try to stay central to what you wanted to see. 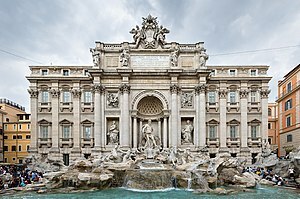 We stayed at Hotel Trevi (around the corner from Trevi Fountain). It was the hub of a wheel that led out to all the sites we wanted to see. The longest walk was to Saint Peters and Vatican City. Vatican city is a separate country from Italy. The Pope is the president and the Swiss Guard its army. Walk the streets of Rome and enjoy what you see. Stop for a gelato or a Prosecco (Italian Champagne) at a bar. Drop into small stores and enjoy the city and its people. The old history is important but the modern city and people are as well. Is winter a good time to go to Italy? It depends on what you want to do! Northern Italy gets snow but if you are a skier this is perfect. Picture yourself in a small hotel at the foot of the alps. You have T-Bars up the mountain and at the end of your day you return to a warm hotel with a blazing fire. Maybe a drink and some warm polenta. Northern Italy is all about snow and skiing. As we move away from the mountains to Milan we still have winter snows but Christmas time in Milan is beautiful. Christmas lights everywhere, warm people and great food. Don’t forget the Milanese fashion. Milan does everything first class. If you enjoy the character of New York city in the USA, then you will love Milan, Italy. As you travel south to Rome you can still get cold weather and some occasional snow but again Christmas time is a celebration. 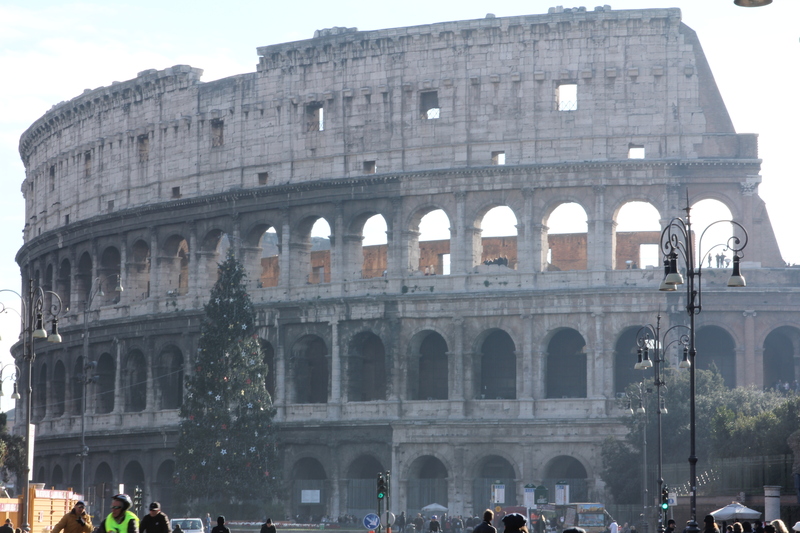 We were in Rome in 2011 for New Years Eve and New Years Day celebrations. We got to see the Christmas lights and walk the main streets at midnight (closed to car traffic) and drink champagne under the Christmas lights. At Victor Emanuel (The “birthday cake” building) they set off fireworks at midnight. Proceed farther south into Campania and beyond and winter is mostly in the mountain peaks. They can get an hour snow every so many years but it never lasts long as normal winter temperatures are in the 60’s. It is the rainy season in southern Italy. This can be heavy at times but is usually very tropical. Wherever you go, enjoy yourself and be Italian. On our recent trip to Paris, we decided to take a small side trip to Reims. Reims is about 90 miles north-east of Paris and is one of the main champagne cities. We bought train tickets from Paris Est Station to Reims. It was a direct 200 mph train that took only 45 minutes. Once their Reims a beautiful city to walk around. It has its own Notre Dame Cathedral. It has great shopping and many restaurants and cafe’s. We walked around in the morning then stopped for lunch. After lunch we went to Tattinger Champagne house. It is the 3rd oldest champagne house in France. They have a huge area of caves that hold millions of bottles of champagne. they also have a modern facility that holds another 20 million bottles. Champagne is hand turned carefully to collect the sentiment in the bottle. It is then turned up-side-down and the neck is frozen. In this way the small ice wedge is extracted with the sediment. After a great tour we had some ice cream…yum! We sat at cafe’s and had wine or beer and watched both the French and the tourists go by. This is a must trip if you like smaller cities than Paris. It is also a must if you enjoy real champagne. The train trip back to Paris was equally fast. All in all, it was an enjoyable day outside of Paris. We just got back from a visit to Paris. We took two people who had never been to Europe before. It was great seeing this magnificent city through their eyes. They were amazed at the grandeur of the churches, friendliness of the people and the people watching along the small streets of Paris. Yes I did say friendliness of the French people. I have always found them to be friendly. It is like many people here in the states think of New Yorker’s as cold and not caring. This is totally wrong, they just don’t walk around saying hello how are you to everyone they pass. Parisians are the same. If you try a little of their language like Merci and Bon Jour, they respond with a smile. We had lunch at a cafe in Reims (Champagne area) and joked with the owners. We all laughed and had a very enjoyable lunch. Hours later we were walking back from a champagne tasting to the center of Reims and a car beeped its horn at us and a woman waved. It was the owner of the restaurant saying hello! Smile, be kind and BE RESPECTFUL and you will be treated likewise. The rule I tell everyone we take around Europe is “You are in their country! don’t ask why they don’t do things like we do.” If you remember this simple rule, you will have a more enjoyable vacation.